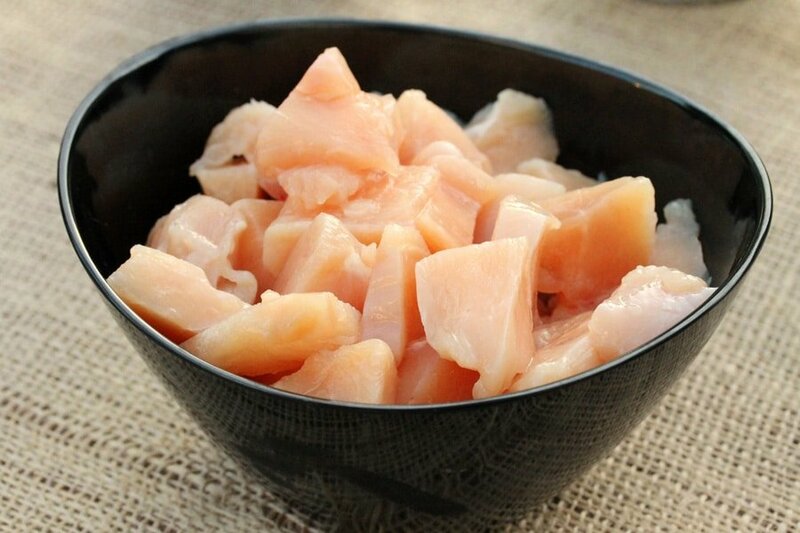 Boneless skinless chicken breasts come in so handy for quick and easy meals like this one. 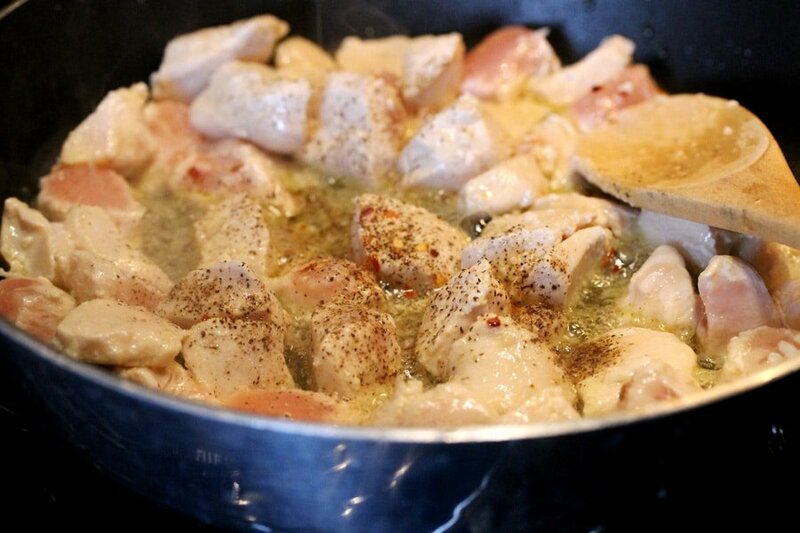 In this recipe, chicken is sautéed with dried red pepper flakes and ground pepper to give it some heat. 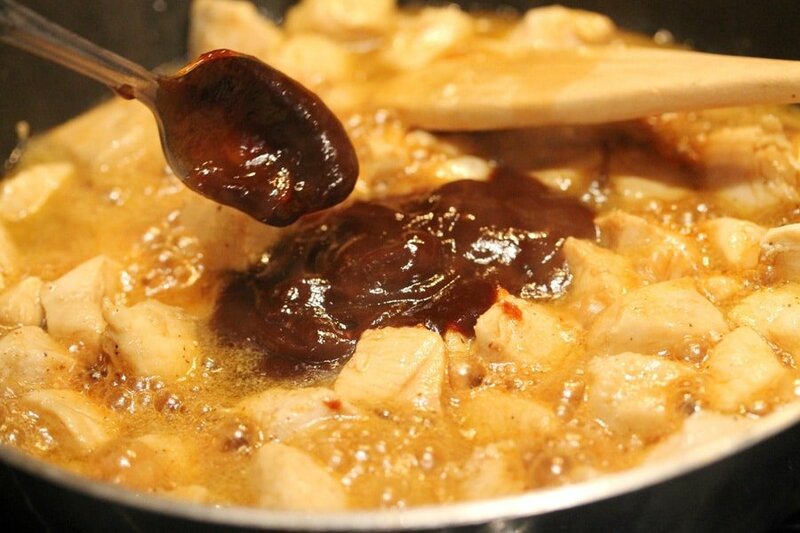 And since spicy tastes so good with sweet, next….honey, barbecue sauce (one that is on the sweeter side) and soy sauce is added to the mix. Then to finish off the chicken, coconut milk is added. 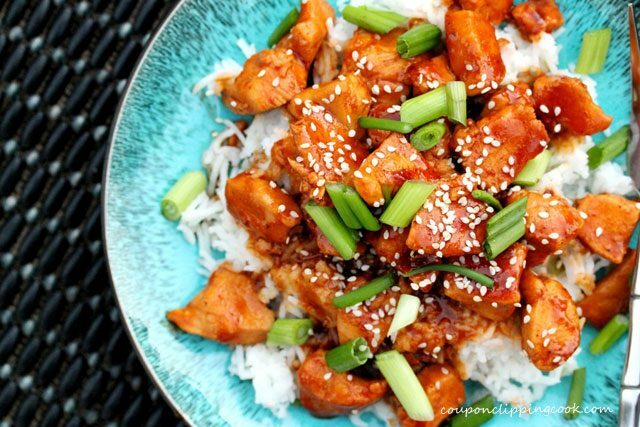 The coconut milk ties all of the flavors together and gives the sauce a nice consistency. 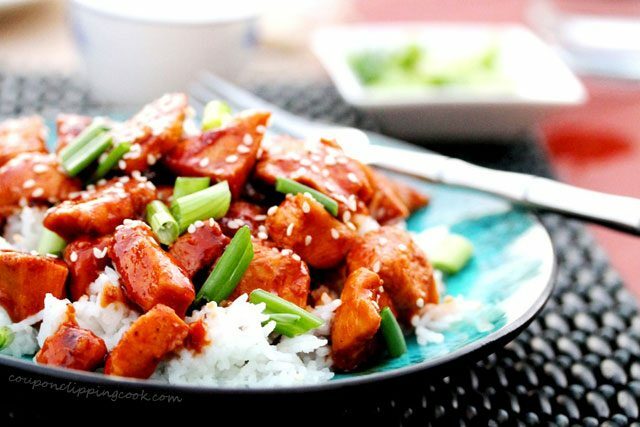 Once the sauce reduces just a little, this sweet and spicy chicken is ready to serve over rice. 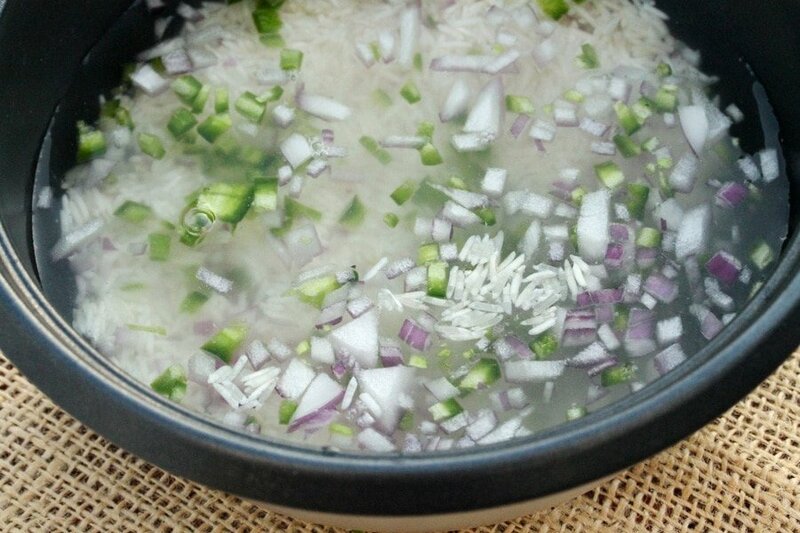 In this recipe, Basmati rice is used and cooked with diced jalapenos and red onion. Feel free to change up the rice to one that you like. 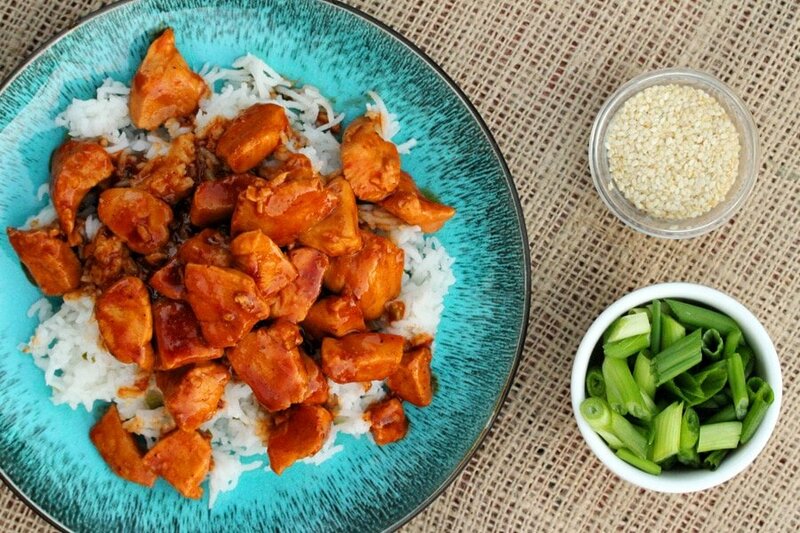 Here are more quick and easy recipes made with boneless skinless chicken breasts “Barbecue Chicken with Rice“, “Nut-Crusted Coconut Chicken with Peanut Sauce“, and “Simple Chicken Nuggets“. 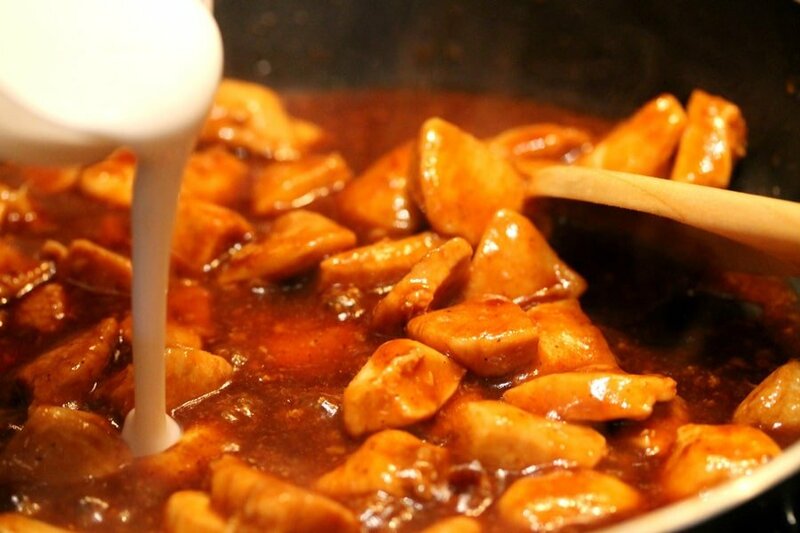 Let’s check out the ingredients for this delicious Sweet and Spicy Chicken. Cover with a lid and set the rice cooker on the cook setting. 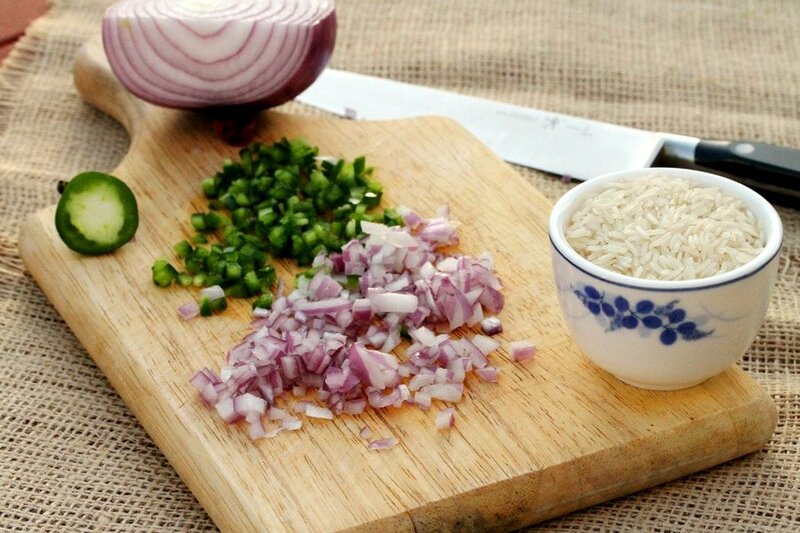 When the rice is done cooking, stir so that the jalapeno and onion are evenly distributed in the rice. 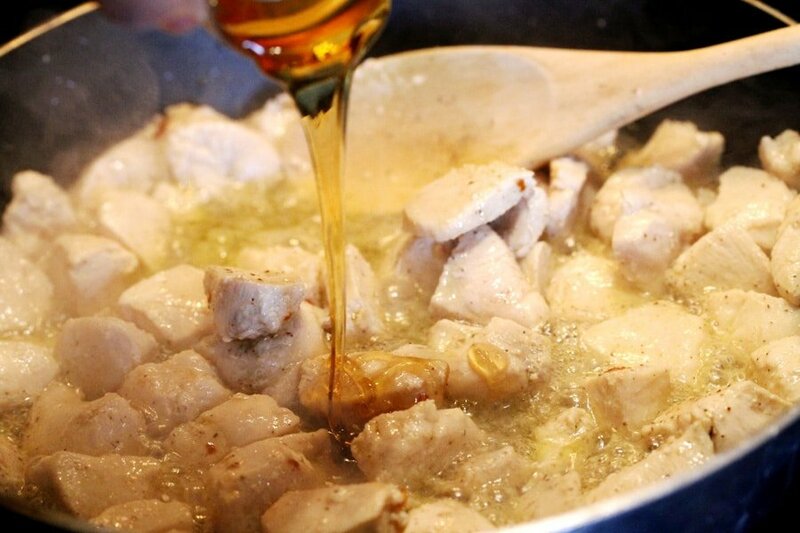 To the skillet add the chicken and stir. 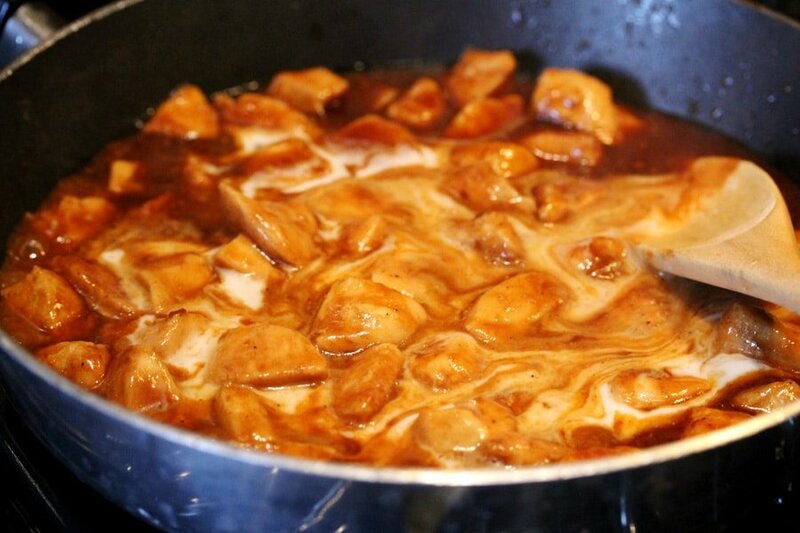 Let the chicken cook for 5 minutes stirring occasionally. 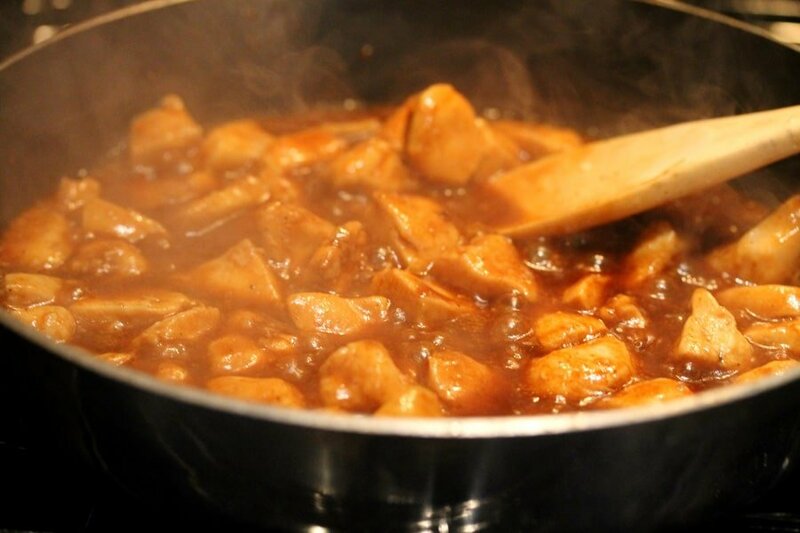 Continue to cook and stir occasionally until the chicken is cooked through (about another 2 minutes). 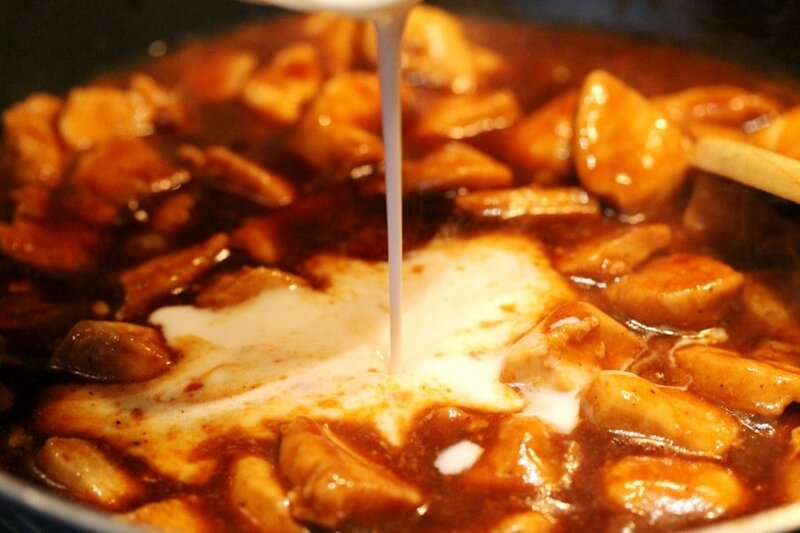 If the sauce starts to bubble, turn down the heat a little. 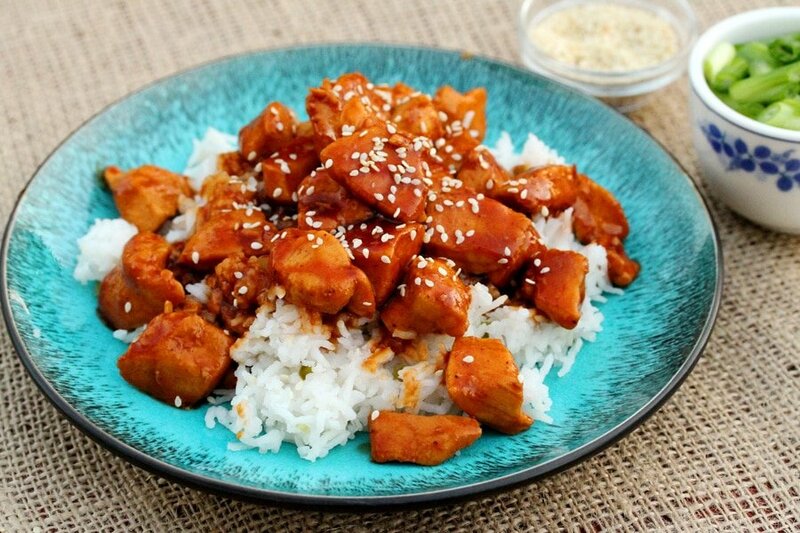 Serve while warm over rice. 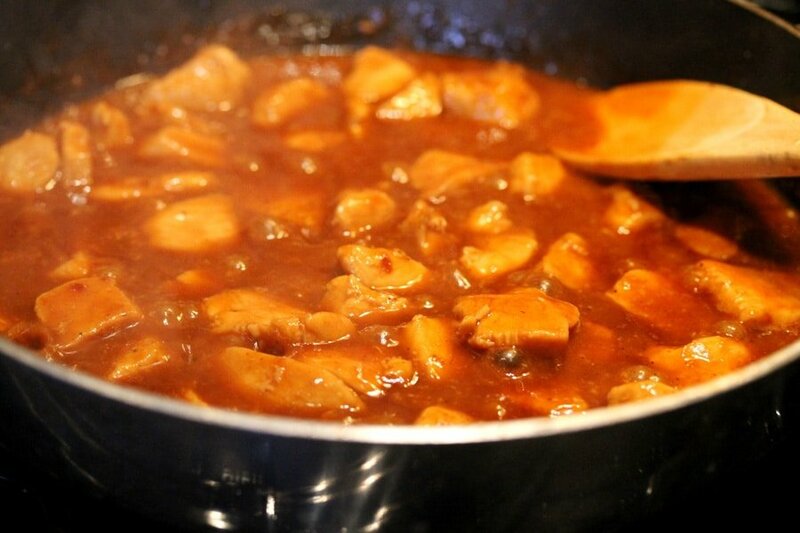 …and top with the warm chicken and sauce. …each and every sweet and spicy bite. 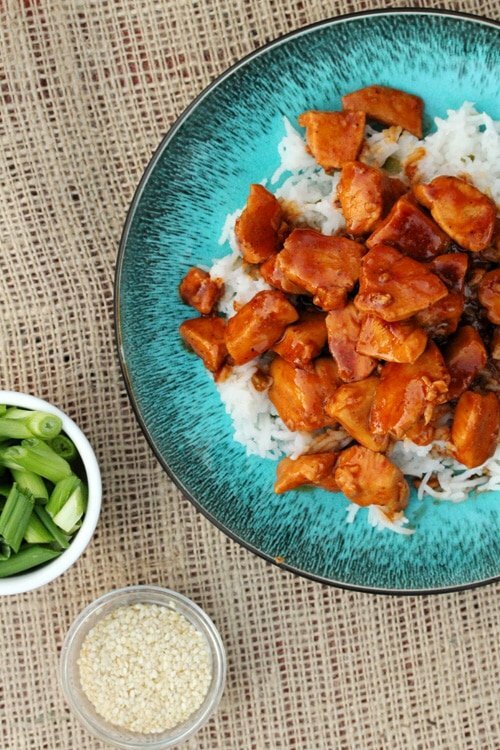 Quick and easy to make and full of flavor. 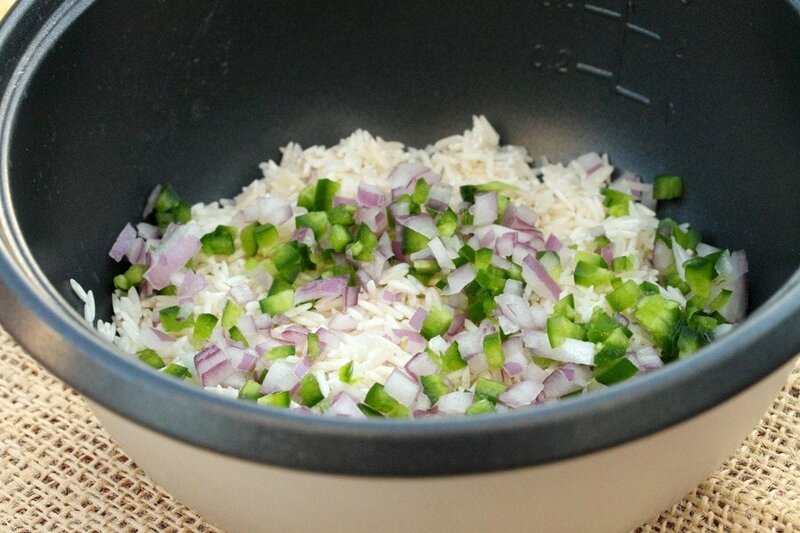 To a rice cooker pan, add rice, jalapeno, red onion and water. 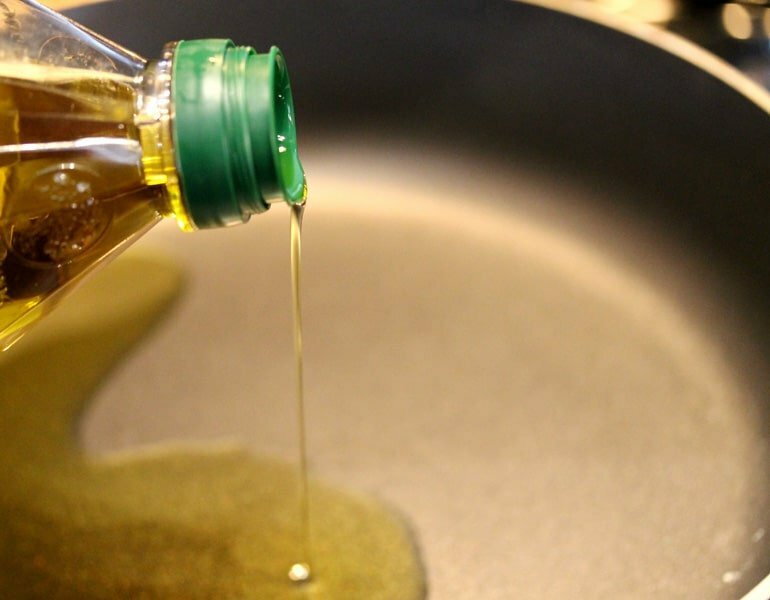 Heat a skillet on medium heat and add olive oil. 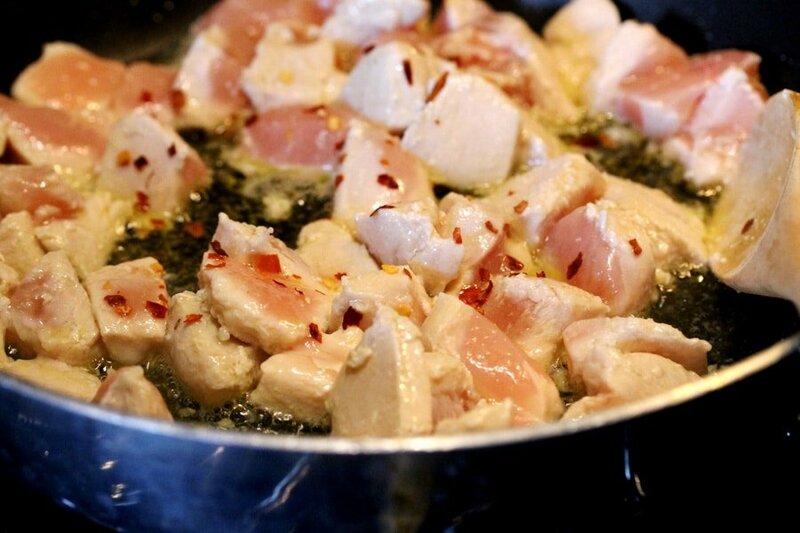 To the skillet add chicken, dried red pepper flakes, ground pepper and stir. 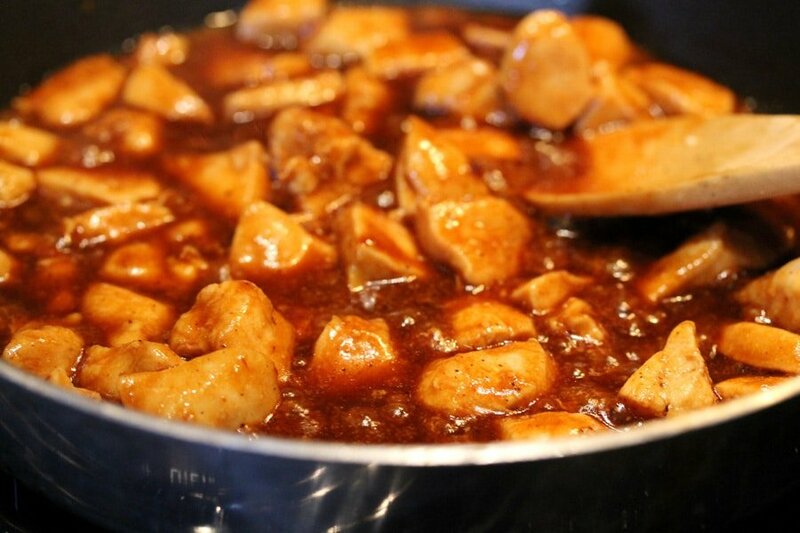 To the pan, add honey, soy sauce, and barbecue sauce. Stir together. 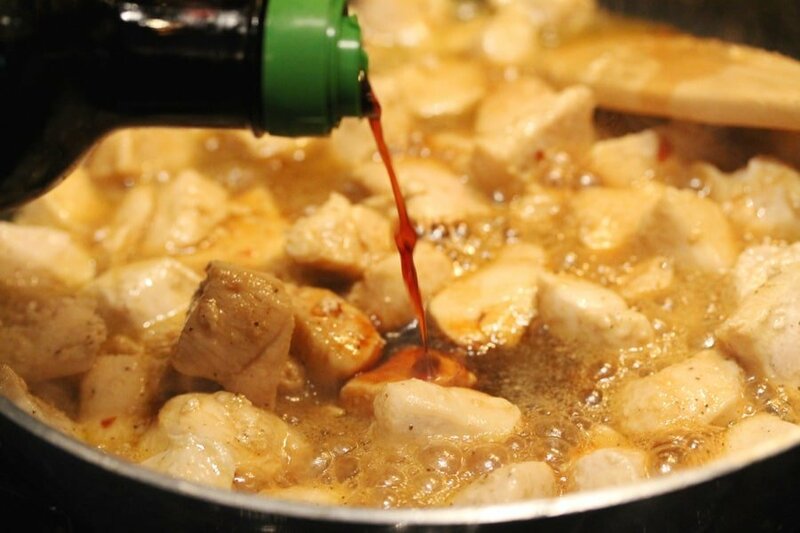 If the sauce starts to bubble, turn down the heat a little. 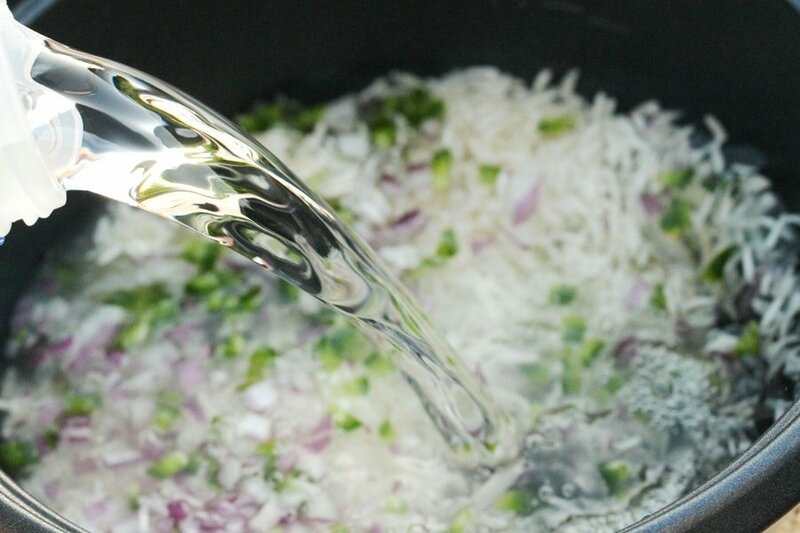 To the pan, stir in coconut milk. 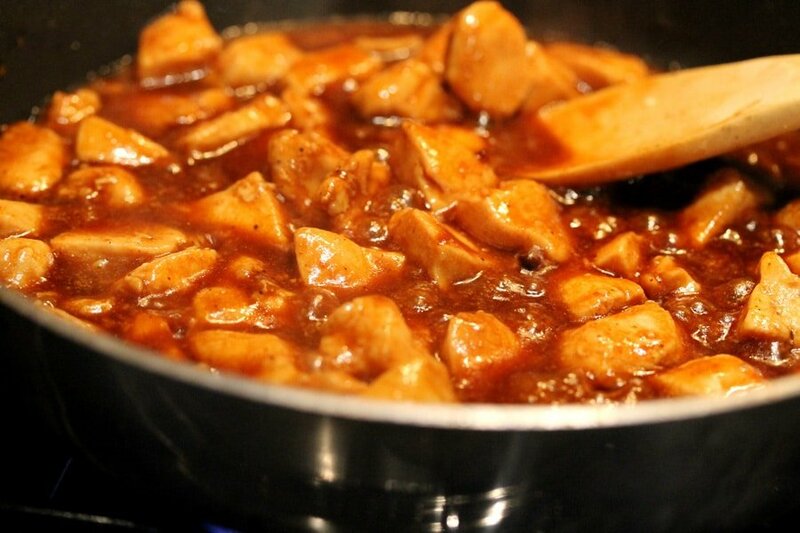 To serving dishes, add warm cooked rice and top with the warm chicken and sauce. 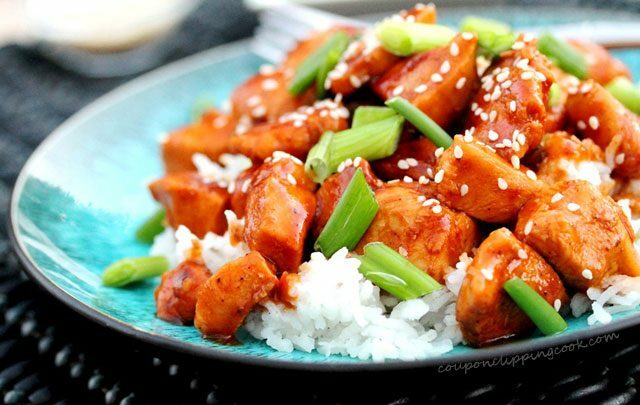 Garnish with the sesame seeds and cut green onions. Hi Joy, so glad you like it. Thank you and have a nice weekend! Oh my gosh this is really amazing. 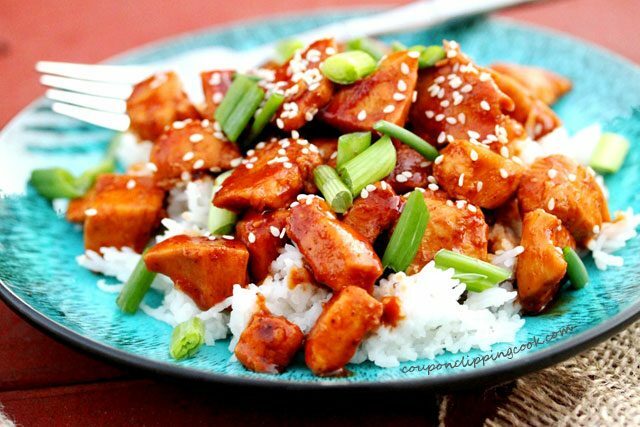 I want to make this asap. 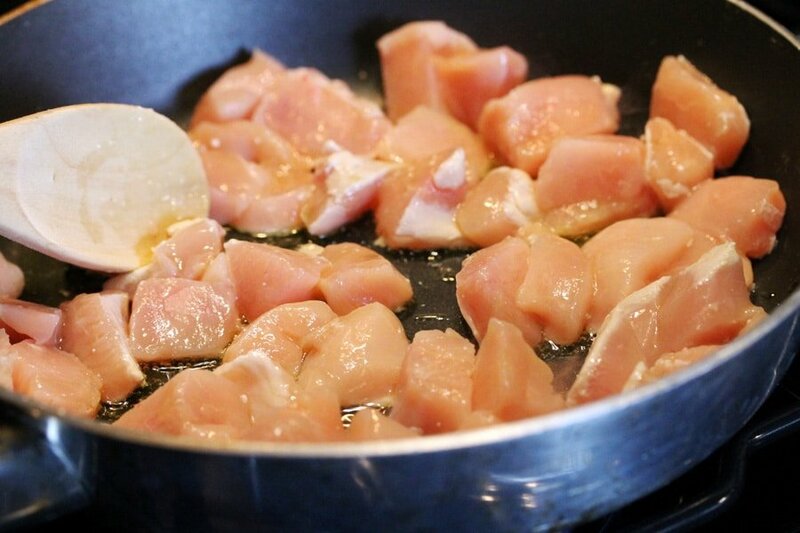 I am suppose to be going to bed and all I want to do it make this yummy chicken. Hi Kim, you’re so funny. I hope you don’t have bad dreams about this chicken. Thank you and have a nice weekend! YUM! 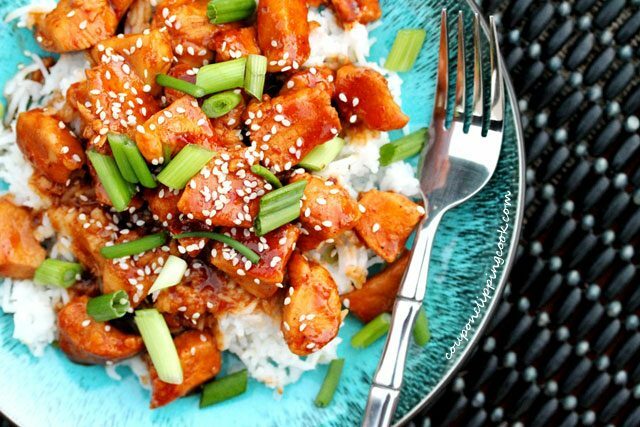 I have all the ingredients on hand and can’t wait to make this! Coconut Milk does bring flavors together, which is why I ordered a dozen cans from Amazon! LOL. So glad to know others stock up on things like I do! 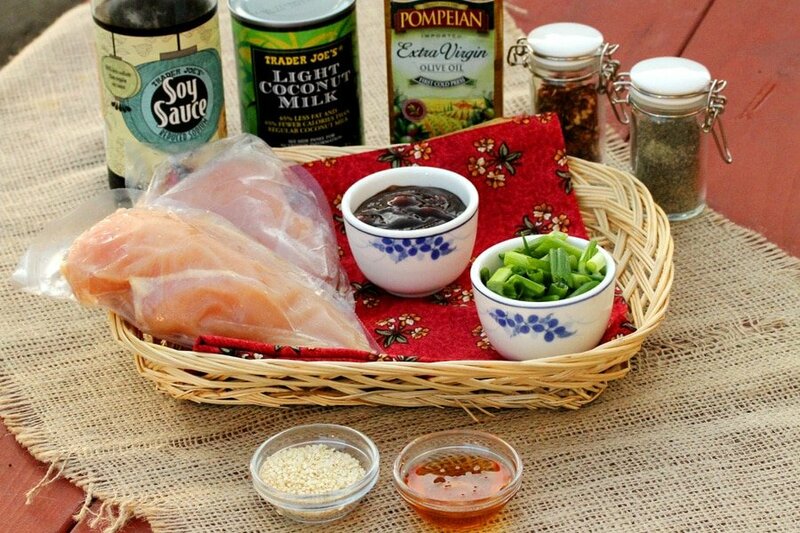 Coconut milk is fun to have on hand for recipes. Have a great day! After seeing all those pictures, I am now craving this. Good thing I stocked up on coconut milk. I usually stick to the list, but something told me I would be needing it. 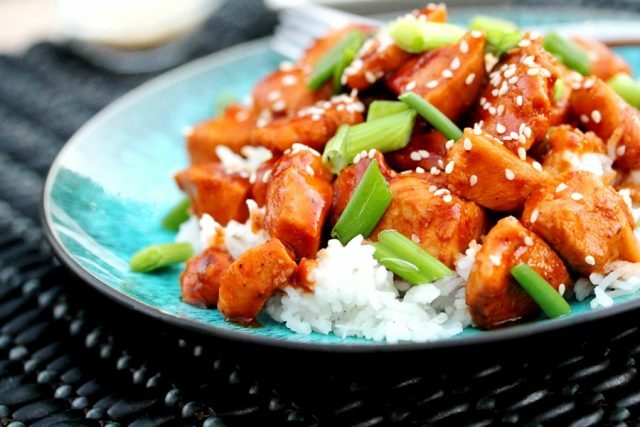 This recipe does have some good flavor ingredients and looks fairly easy to prepare. Glad you posted this one-yum! Hi Tina, so glad you like it. Have a nice weekend!